Each year more money seems to go into football, players are costing more and they are being paid some amazing salaries. Many players have salaries of millions each year but beyond this, players earn a great deal of money through sponsorship and endorsement deals. As a result, their earnings are often far higher than their salaries. Around ten years ago the top salaries were in the region of $29.5 million, but this has massively increased as more money floods into the game from domestic and international television agreements, kit deals, wealthy owners and so on. In recent years Cristiano Ronaldo and Lionel Messi have dominated football. Not only have they won nine out of the last ten Player of the Year awards, but they have also commanded the biggest salaries ever seen in the sport. For the past four years Real Madrid’s Ronaldo has been the world’s top paid football player. In 2017 he banked an incredible $93 million, more than nearly every other professional athlete in the world. The majority of the money, $58 million, came from his salary and bonuses before taxes. During the same period the FIFA Player of the Year was the top goal scorer in his team and helped them win the Spanish league title and back-to-back UEFA Championship Leagues. To give some perspective on how much Ronaldo is earning, LeBron James, the best paid NBA player and widely considered one of the all time greats made $31 million playing for the Cleveland Cavaliers this season, and with all his endorsements he took home $86 million, significantly less than Ronaldo. Thanks to a new contract that Ronaldo signed last year taking him through to June 2021, he will continue to earn close to the same amount for the next three years. In June 2021 he will be 36 years old and he has already said that he would like to sign another contract and continue playing into his forties. In addition to his salary, Ronaldo made a further $35 million through sponsorship deals. He helped advertise a huge range of companies including PokerStars, Nike, Tag Heuer, Clear men’s hair products, Herbalife, XTrade, Nubia, Pestana hotels, Sacoor Brother, and his CR7-branded range of underwear, shirts shoes and fragrance. Just the money from these deals is enough to put Ronaldo in football’s top four paid players. Ronaldo is easily the most popular athlete in the world. He has an incredible 275 million social media followers across Facebook, Instagram and Twitter, as well as an international airport named after him. As a result, it is possible to argue that he is underpaid. 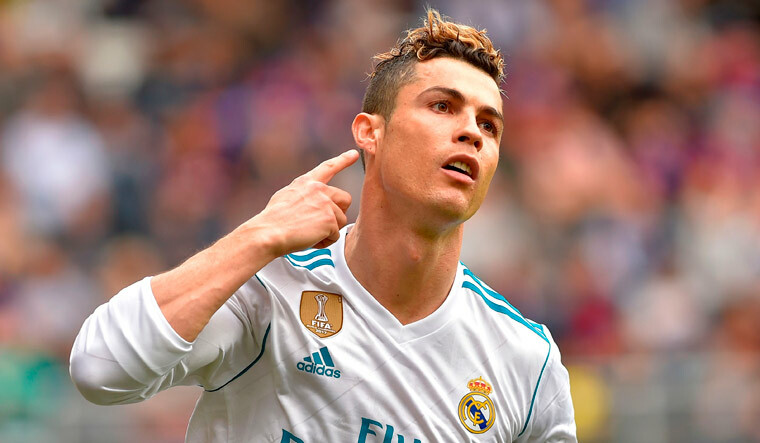 The social media valuation company Hookit found that thanks to Ronaldo’s huge social media presence he created an impressive $176 million in earned media value for his sponsors in the period from June 2015 to 2016. That represents an impressive 449% return for their investment in him, before considering television, print and other media. In December two years ago (2016) Nike gave Ronaldo a raise and a lifetime endorsement deal that is worth as much as $1 billion. This is the third deal of its kind that Nike has made after James’ deal and Jordan’s Nike-owned iconic name brand deal. However, considering that Ronaldo generated a massive $474 million in value for Nike in 2016 through just 329 social media posts, it is arguable that the company got the better end of the deal. Ronaldo’s teammate and five-time global player of the year Lionel Messi was the second highest earner of last year. He earned a total of $80 million, not too far behind his teammate. Messi has one year left on his playing contract that has been paying him $50 million in salary and bonuses. Last season Messi scored a La Liga high of 53 goals and assisted on 16 others in 52 club competitions. As a result, it seems more than likely that he will soon be offered a new deal that will keep him on similar conditions to Ronaldo, especially as he is significantly younger. It was no surprise when Adidas renewed a lifetime agreement with Messi just a couple of months after Ronaldo’s huge deal with Nike was announced. Adidas is the source of half of Messi’s $27 million endorsement income. It became a more important part of his commercial dealings after a lapse in a 5-year contract with ES Sports that saw Messi feature four times on the cover of the famous FIFA video came. While Wayne Rooney is in the twilight of his career, he still remains a significant earner. In 2007 the then 21 year old Manchester United striker was earning an impressive $17 million a year ($20.3 adjusted for inflation). The fact that he is still around a decade later, albeit without quite the same status, is a testament to his staying power. Rather than being a mid-20s poster child for the tabloids, Rooney is today a proud family man and regularly highlights his life with his wife and three children on social media. Last year Rooney earned $23.6 million of which $17.6 was his salary and the other $6 million came through sponsorship deals including with Nike. While he became United’s all-time leading goal-scorer with 253 goals last season, he also left the team at the end of the season and took a significant pay cut when he moved to Everton. The exact details of his new contract aren’t known but it is thought that it is worth around $20 million. Collectively, the twenty top paid football players last year made a total of around $413 million in salary and bonuses and another $162 million in endorsements bringing the total to $575 million. In the top twenty, the majority are from the English Premier League (eight) and there are seven from La Liga. Unsurprisingly as the most popular leagues in the world, the clubs in the leagues have the top two highest average salaries per first team player. According to figures in the Sporting Intelligence Annual Global Sports Salaries Survey 2016, EPL salaries were an average of $3.2 million and La Liga salaries were an average of $1.6 million. Manchester United was the top paying football team with the highest average salary of $7,616,400. One of the reasons for this was Zlatan Ibrahimovic’s signing in July 2016. The striker left Paris Saint-Germain and earned an impressive $27 million in salary and bonuses the following season. Combined with his income from sponsors such as Volvo, Vitamin Well, and his personal line of training clothes, A-Z, Ibrahimovic earned a total of $32 million last year. Also on the list of top earners is his teammate Paul Pogba. Pogba made the move from Juventus to Old Trafford and was partly tempted by the generous contract on offer. He made $17.2 million for playing in 49 games and scoring 9 goals while assisting on 6 more. He also has a 10 year deal with Adidas that is thought to be worth around $45 million. All the players discussed so far have been in European leagues. However, in recent years big money football has spread abroad and with China’s president, Xi Jinping, aiming to make the sport a national priority, a huge amount of money has been going into Chinese football. Jinping wants to make China a country capable of qualifying for, hosting and winning the World Cup and as a result there are now players in the Chinese Super League amongst the top earners. The Brazilian forward Hulk made the move from Zenit in the Russian Premier League to Shanghai SIPC and receives a salary of $19.1 million. Furthermore, thanks to his Mizuno boot sponsorship, his earnings totalled $20.1 million. Similarly, Graziano Pelle made the move from Southampton to Shandong Luneng. His two and a half year contract paid him an impressive $17.1 million and he earned further $1 million through endorsements and sponsorships. Attendance at Chinese football matches is steadily growing and a 5-year television rights deal with the state-backed China Sports Media was signed last year. This has led to an extra $1.22 billion going into the league. As a result, it seems highly likely that transfer fees and salaries in China will rapidly increase in the coming years.